2015 was both a busy and a quiet year for PASSPO. Busy in that they toured relentlessly but quiet in that the only new musical offering came in the form of album “Beef or Chicken?” in mid-May. Before that, their last single “Himawari” had come out in August of 2014 so things had been pretty barren on the musical front for a while. I mean, I guess you can count the two “Best Of” albums (that makes 5 altogether now) that came out last December, but can you really? I’m not really one to speculate on why things have been so slow, but the fact that PASSPO have recently jumped ship from Universal Music Japan to Crown Records perhaps speaks volumes. It’s going to be interesting to see what kind of pace that PASSPO will release new music this year, but I’ll take a guess and say we’ll probably get more than two singles before the year is out. I’ve been a fan of PASSPO since around the “Shoujo Hikou” days, so that’s what? Going on 5 years at this point? They’ve put out a lot of great music in that time, and when they’re on their game they’re one of the best groups around. Unfortunately, for me anyway, PASSPO haven’t been on their game recently. I didn’t buy into the “Honey Dish” hype so when I heard we were getting a new single after a year and half of not having any, I didn’t really pay much attention. That turned out to be a pretty big mistake on my part. That thing I said about when PASSPO are on their game? Yeah, they’re really on their game with “Mr. Wednesday”. To use some baseball terminology, this one is a grand slam in my book. I’m kind of over the whole “Top 10” lists at the end of the year thing, but if I were to do one then I wouldn’t fancy the chances of any other groups out there to top this. I don’t do top 10 lists anymore though so I don’t have to worry about that. Hopefully I’m not coming across too strong with how much I love this song. In the past I have been accused by people of being too negative so when I do actually really love something, I try to put the point across as strongly as possible. In this case I’m also just ecstatic that PASSPO appear to have found their mojo again. I can’t think of anything worse as music fan than just not enjoying the output of a group that you really like. Seriously, “Mr. 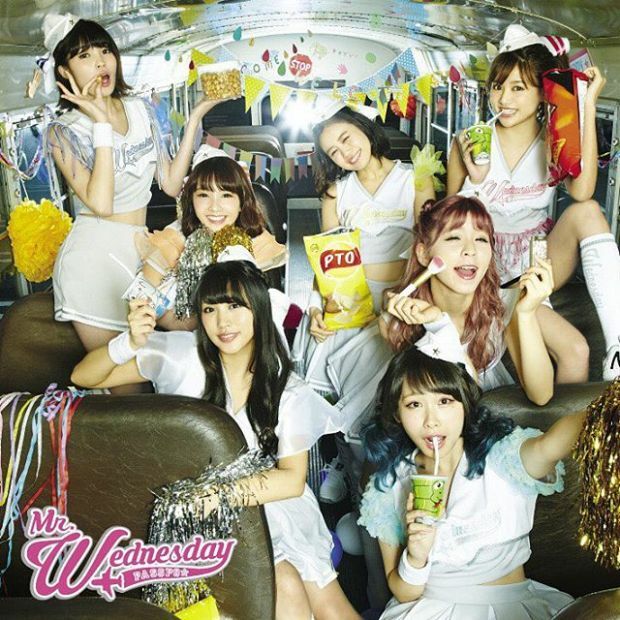 Wednesday” has everything I want in both a PASSPO and a J-Pop song. It’s instantly memorable, even before Mori Shiori sings the first line, which isn’t something you can say about most songs (most songs also don’t feature Mori Shiori). The instrumentals, as I alluded to, are just pure ear candy and are also familiar somehow but I can’t quite place it. And where do you even begin with that chorus? That’s how it’s done people, I don’t know where all of the hooks in choruses have gone lately but please someone find them and bring them back. “Mr. Wednesday” isn’t the only song on this single though. Although to be honest they could have just released it like that and I would have had zero complaints about it. That’s not the case though, and “Musical Party” has the unenviable task of attempting to follow the act that came before it. The entertainment business is a rough place folks. Having said that, “Musical Party” is actually a pretty nice little song in its own right. It’s definitely a much more rock oriented affair than the single’s a-side, something that PASSPO have shown that they’ve been able to pull off with great success in the past. That’s the case here too, and while it can’t really hold a candle to “Mr. Wednesday” (not much could to be fair), if you judge it on its own merits there’s really nothing to complain about here. The inclusion of “Musical Party” is actually a pretty smart move the more I think about it. It creates a nice contrast to “Mr. Wednesday”, instead of just being too similar, which is a trap a lot of groups seem to fall into. It’s also Crown Records kind of setting out their stall if you will, and sort of reintroducing PASSPO and the range of their musical abilities to the wider public. The single is quite a nice little package in that regard. I’m not really sure what else to say at this point. If you were still questioning how much I love this single then hopefully the rating below will really drive the point home for you. PASSPO appear to be back to their best and I couldn’t be happier about that. Roll on the next single, even if it’s only half as good as this one it’ll still be great.